Or for a free pdf download Click here. Life has been busy and I haven’t had a lot of time free for thinking. I’ve been spending time assisting one of my kids through college orientation and registration along with the cloud of related adulting tasks. Another child acquired a boyfriend, which is a first for any of my kids and so it has sparked a lot of conversations while we all adjust. (We all like the boyfriend, so that is good.) A third child made a course shift in his life plan for the future (equivalent to changing majors), a good one, but needed help processing the decision. The fourth kid once again needs help rescuing classes from failure, and larger help figuring out why he shuts down so completely that he ends up not doing simple tasks that would keep him on track. I acquired a writing support group that looks like it will be amazing for me, but it means new friendships to build foundations for, and that takes thought. Also, because of the new group, I’ve been diving back into work on my middle grade novel, which takes lots of brain time. Several friends had need of support, so I put time and emotion into that. And I was knocked flat by flu for several days. Our bus day. During spring break I declared a Bus Day. I’ve got a kid who intends to live at home while attending college, but doesn’t have a driver’s license. They need a way to transport themselves to school. So we did a family outing where the whole point was to ride the public transit system. I picked a destination in the next town over. (The Good Move Cafe in downtown Provo, which was a delight.) Then we walked ourselves to the nearest bus stop and rode until we got there. It was a fun adventure during which we all learned that local public transit is safe, clean, and more convenient than we expected. We’ll likely have multiple more bus riding adventures to acclimate college-bound kid to the whole system long before the first day of classes in August. This is how we break down the barriers into tiny little steps so that anxiety doesn’t make college crash and burn. Long Slow Remodel weeks 5 and 6. The cupboards are on the wall. They have been for nearly two weeks now. We love them. There are still finishing touches to put up, but the remodel is beginning to shift into it’s next phase. I want to write it all up with pictures. a dentist appointment to get some teeth filled, one of which has developed a sharp pain at food temperature differentials. The very last bit of shipping for the Kickstarter on Schlock Books 14 & 15. Thirty-six packages and it is done. A day trip (using public transit) up to Salt Lake City for FanX. I’m on one panel Friday afternoon and I’m taking college-bound kid with me for public transit experience and for cosplay squee. Relatives in town and staying at my house for a family event. A pile of smaller To Do items, appointments to keep, appointments to make, etc. Once again, the list is full of good things. Life is mostly good. The harder bits seem spaced further apart and don’t seem to sink quite as deep as they used to. And now that I’ve written all of that down, perhaps I’ve emptied my brain enough that I can go back to sleep. Being awake thinking about all the things is not my favorite activity for 2:30 am. I’m lost in the middle of Spring Break week and every day feels like Saturday, but there is a lot of work I’m supposed to be doing for business things. 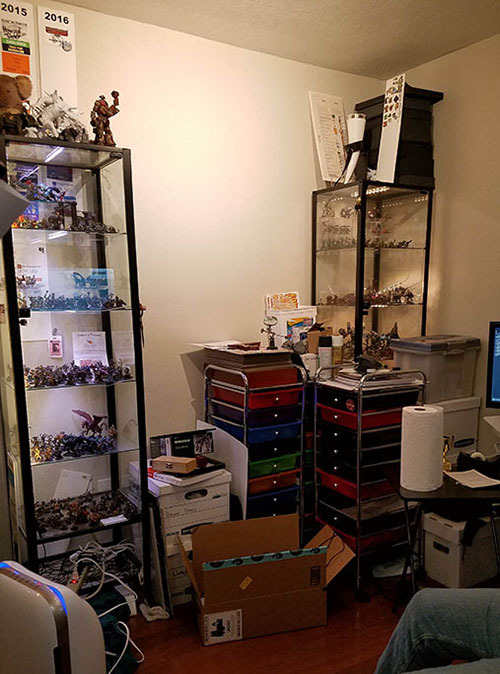 Also I think we’ve reached peak disruption with the front room cupboard project, so everything feels messy and out of control. Some years I use spring break as practice for summer schedule. This year not so much. Oh well. Tomorrow is outing day. We’ll see how that goes. We called these our “test cupboards” we were learning the process of finishing the cupboards and experimenting with hanging them. That way we made most of our mistakes on cupboards that will not be on public display the moment people enter the house. With Howard’s cupboards looking spiffy, I turned our garage into a full workshop and worked on the front room cupboards. As of today, the boxes for the cupboards were ready, so we stacked them in the front room to help us visualize how it would go. Milo helped inspect. Picture this arrangement about four to five feet higher up on the wall with shelves in the gaps between cupboards. Stacking and visualizing turned out to be really smart. We identified a problem. The spacing of those upright cupboards is such that it is impossible to attach all of them to studs simultaneously. We came up with a plan where we’re using planks behind the cupboards as additional support and to create a sort of framing structure. We also realized that our intended height would make most of the cupboards hard to access. but hanging the cupboards lower would cause a problem hanging some of our long coats on hooks below the cupboards. That was when we came up with this arrangement, which we like way better. The upright gap will still have shelves. The open bottom gap will house coats. So now I’ve got planks to stain, side panels to stain and doors to finish varnishing. Oh, and there is crown molding that I also need to stain. The good news is that I enjoy painting stain and varnish on wood. So the project is being fun. This week NASA was supposed to have the first all-women space walk. Two female astronauts were going to don space suits and leave the space station to do necessary maintenance. This event gained traction on social media where people became excited at a milestone event demonstrating that women were less sidelined than they used to be in STEM fields. Then the mission was scrubbed because the space station only has one suit readily available that is sized appropriately for women. It was a decision made solely on logical, safety reasons, with no intent to take something away from women. There is no intent to make women less than or push them to the side. And yet, a woman has to stay in the space station so a man can take her place. I’ve been watching conversations about this via twitter. I’ve seen explanations of space suits and why fit is a safety issue. I’ve seen long historical threads showing the history of Women and NASA. I know that this is, theoretically, only a small setback in the progress of women in science fields. Or rather, it could be a small setback as long as those in charge of budgets use this moment to commit to making space suits for a larger range of astronaut body types. According to the article linked above, NASA is committed to doing just that. However, they aren’t the only ones involved in the decisions. It would not all all surprise me to see that for logical, financial, and space reasons the people in charge decide not to fund, transport, and store more space suit sizes. It has happened before, which is part of how we ended up here. In order to allow two women to space walk together, someone has to decide that making that possible is more important than logical financial calculations. Based on past record, I can’t feel sure that someone will decide in favor of a wider range of suit sizes. Even if they do, there is still a loss here. This moment is gone. These two astronauts can’t do their job together this week. Because of duty rosters they may never get the chance to walk in space together. That may or may not be a personal emotional loss for these astronauts. But I am definitely seeing sadness and loss in people online who were looking forward to a moment that is now pushed off into an uncertain future months or years from now instead of happening this week. I am feeling the loss of that moment. Not so much because I was eagerly anticipating it or riding much emotion on an all-female space walk, but because having the moment taken away resonates with personal experiences where for logical, financial, scheduling reasons I had to do the equivalent of staying inside the space station while someone else goes out to walk. A single incident of this type isn’t so bad, but I have an accumulation of them. Over and over and over it makes perfect, logical sense for me to stay at home, to not go to events, to put my creative work aside and do the administrative work instead. The pattern is persistent enough and grieving enough that Howard and I have deliberately taken steps to counteract it. We sometimes choose to ignore the most logical path and decide based on emotional or aspirational reasons instead. Having these conversations and altering our decision processes has done much to heal me from the repeated wounding I experienced. I still get hit by it though. Usually by events/decisions outside Howard or my decision making power. And it’s never personal, just logical. So I really hope that NASA and others with decision making power use this as a moment to remember that they are an aspirational entity. All of our space missions exist because we’re willing to reach for learning and experience that doesn’t always make logical financial sense. Making space accessible to more people means more sizes of space suits, and more people on design teams who recognize the need for them. NASA can do better. We all can. This was a week without much photographable progress. And yet, Howard figured out the method and supplies he’ll need to install the in-cabinet lighting. I completely varnished and shined all the cabinets for Howard’s office. Then I sanded and prepped all six cabinets for the front room. 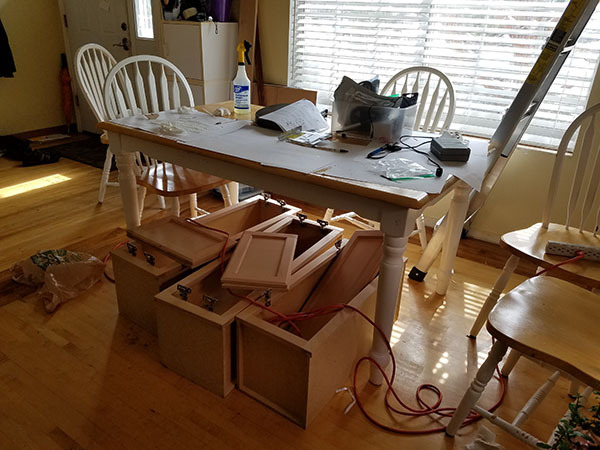 The project is underfoot in a dozen different ways, but we’re learning a lot and hopefully by next week we’ll have all the cabinets up in Howard’s office. There is a video called It’s Not About the Nail where a man and a woman are having a conversation. She is struggling with some things, he thinks he can solve them by removing a nail, she get’s mad at him for trying to “fix it.” That is a very rough summary and you should really just click the link and watch the video. It is only a minute and a half long and the rest of this post will make more sense if you’ve seen the video. The thing is, I’ve been on both sides of that conversation. I’ve been the one with a problem who really wants to be heard and sympathized with. Once I have that sympathy, I’m able to step back and decide to pull my own nail. However, until I decide to pull the nail, I resent people suggesting I should. The woman is not being ridiculous or strange. She honestly needs to be heard and understood. That need is every bit as real as the nail. This week I spent a lot of time on the man’s side of the conversation. It is a very frustrating position to be in, to watch a loved one overlook or dismiss simple solutions which could make their life measurably better, while building a host of coping strategies around keeping the nail in place. So I’m waiting and making sympathetic noises and making sure that my loved one has the tools so that once they decide to pull the nail it can be done quickly. Also, having nail-pulling tools laying around helps plant the seed that maybe the nail is a problem that can be solved. My heart is tired from this week. And I’m having to remind myself that after a period of calm growth, it makes sense to have some struggle. This week’s struggle doesn’t negate the growth and possibly helps lay groundwork for new growth. My mother is an inspiration to me. She raised seven children with steadfast optimism and unfaltering support of any creative endeavor that they wanted to undertake. There was an array of art lessons, vocal lessons, music lessons, and rides to debate clubs, sports events, and writing events. She was there making things possible for one kid after the other. Once all the kids were launched, Mom started taking herself to classes. While continuing to be a supporting Grandma and lately great-grandma, She developed considerable art and writing skill for her own creative work. She dove into writing conferences and applied herself to writing a trilogy. The first book in that trilogy is available today. It is the story of a young girl who is more special than she knows and who goes on a journey of discovery to remember who she is. I’ve watched my mom work on this book for years. I watched when she hired my daughter Keliana as a cover artist. So much work and love has gone into this book at every step. 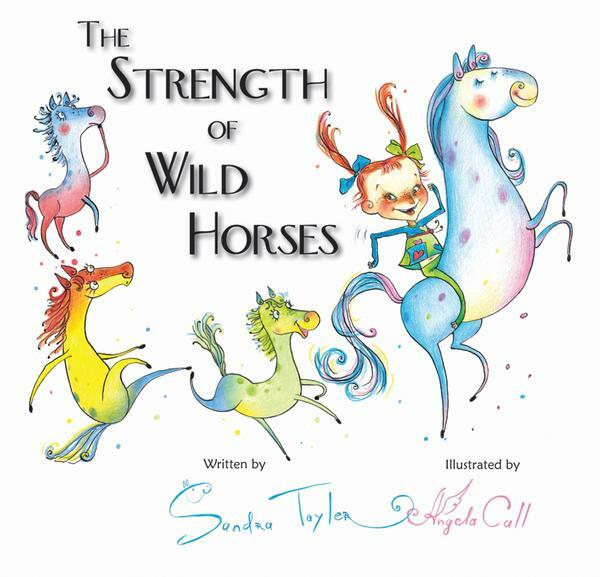 And the book is available now on amazon.com in both ebook and paperback versions. 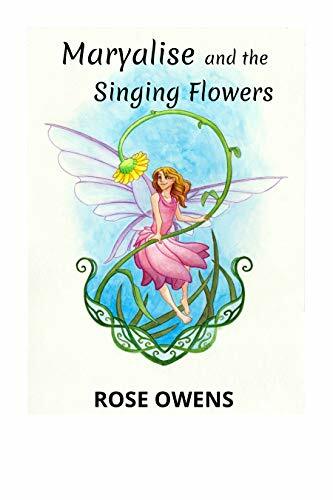 So congratulations to Rose Owens today on her book launch. And perhaps if you know a young reader who likes fairies, they might want to join Maryalise on her journey. Progress was slowed down this week by stain colors. After carefully testing and deciding on a color, I discovered that one of the colors we picked wasn’t readily available. We apparently bought the only pint size can available at the store and quarts were going for $40 or more online. (Retail price on quarts for this brand $8). I tried having a paint store mix the color, but it didn’t match at all. So we back tracked and picked a more readily available color. 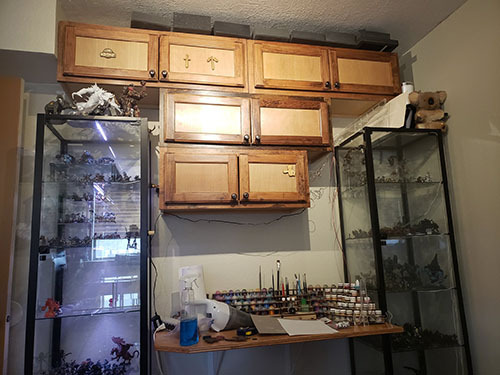 But now we have three more cabinets stained and partially varnished. Staining happens in our front room. 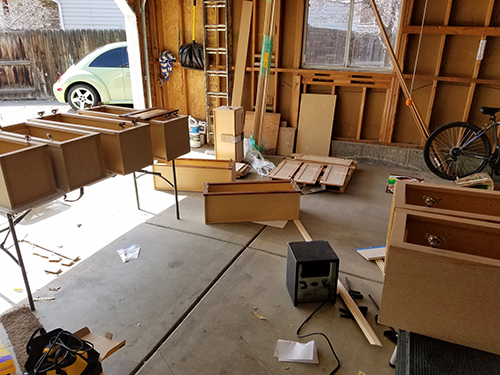 The varnish/lacquer is really smelly and so it has to happen out in our garage, which I’ve turned into a workshop for the duration of this project. Unfortunately, this means we do quite a bit of waiting for the weather to be warm enough so I can work. The lacquer doesn’t soak into the wood or cure correctly if the temperatures are below 50 degrees Fahrenheit. So, not much visible progress this week. But Howard has ordered the pieces for him to install interior lighting into the cabinets. 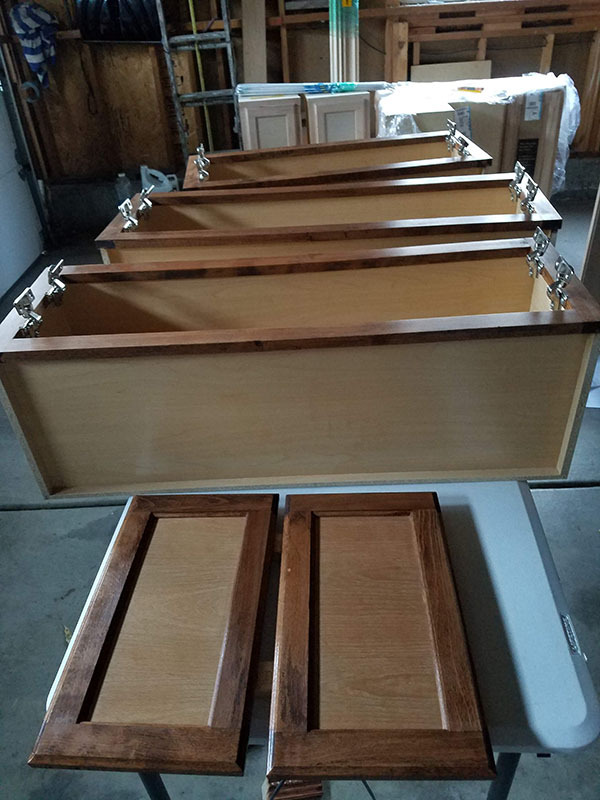 This first batch of cabinets is destined for Howard’s office. The next batch is six cabinets and will go into the front room. I can start on that batch as soon as this batch is completed. prepping the next batch requires sanding and I can’t have tiny wood particles landing in wet stain or lacquer. We’ve been working on a remodel for years now. Six years ago, I repainted the front room. In 2016 I tore out a front closet and we stared at bare studs for 18 months. Last summer we finally put in the railing we’d been dreaming of. 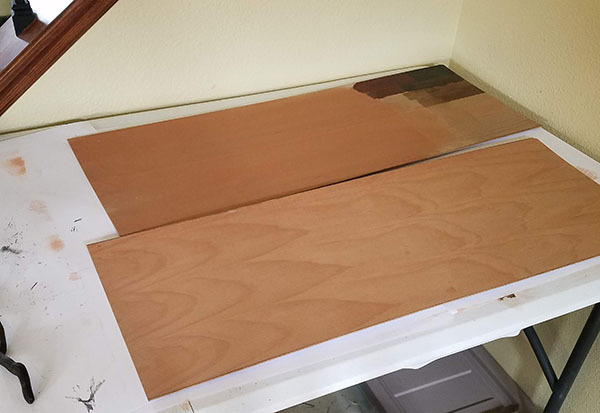 This summer we’ll be putting in work staining unfinished cabinets and installing them. Bit by bit we are going to transform our front room space. 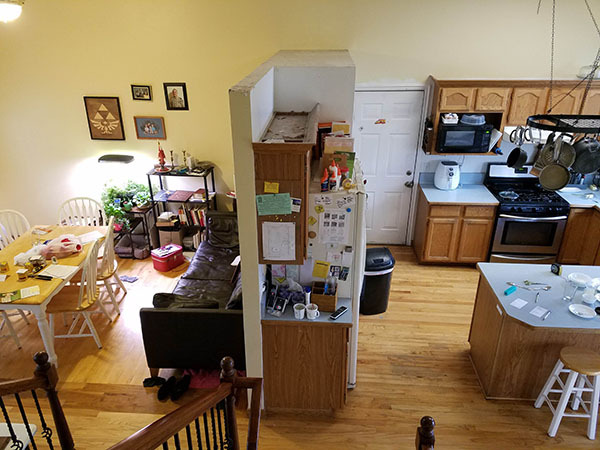 The goal is to get rid of that pantry wall in the middle of the room. It will be replaced with an island counter. But before we can tear down the wall, we have to create new homes for all the food that currently lives in that pantry. We’ll be creating a pantry wall on the other side of the kitchen. 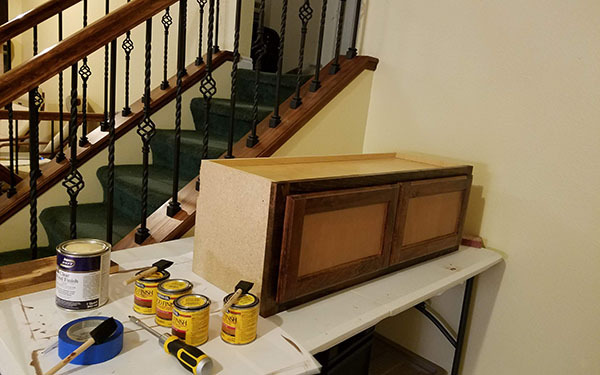 But before we’re ready to put in those cabinets, we wanted to test and make sure that we can actually do this cabinet staining and installing ourselves. 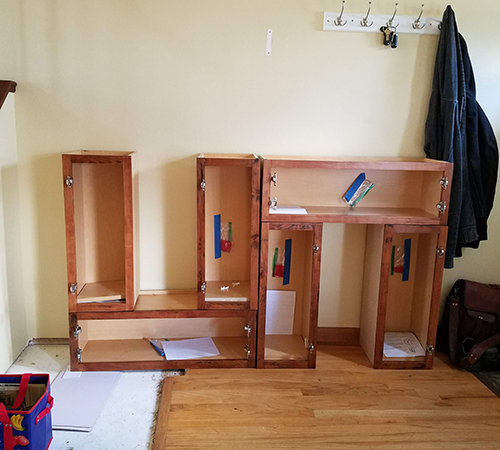 So we’re beginning with installing a painting table and cabinets in Howard’s office, and also installing cabinets and coat hooks in the entry area. 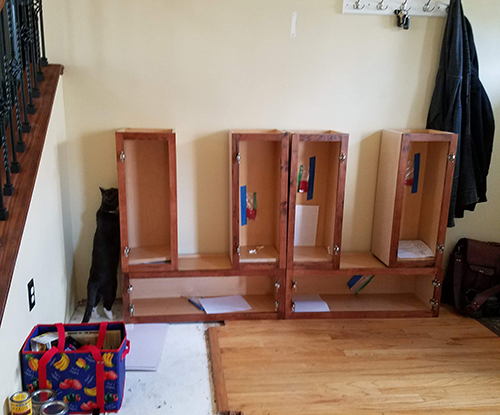 We ordered cabinets and they arrived a couple of weeks ago. Since then we’ve been test staining to make sure we can match the color of the railing. 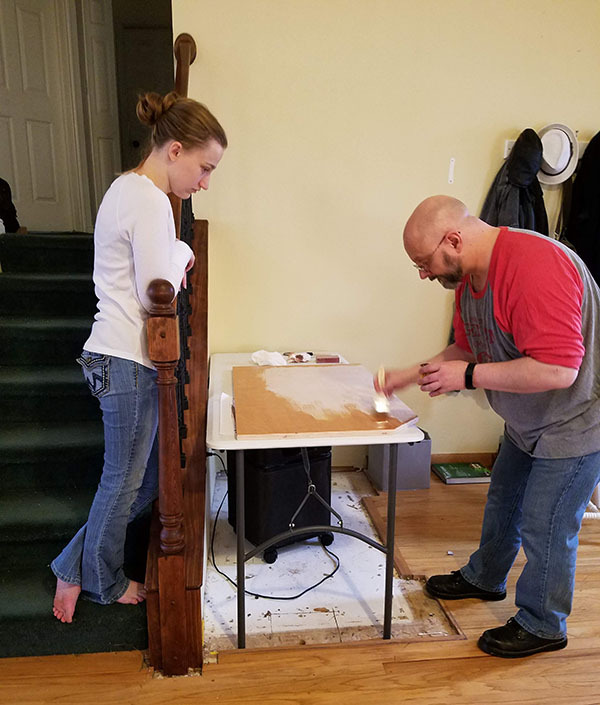 Howard and Keliana picked a piece of plywood with beautiful patterns to be the table top for the office painting station. On the floor you can see the outline of where we removed the closet. We’ve decided on a two-tone look for the cabinets. This is our test cabinet. 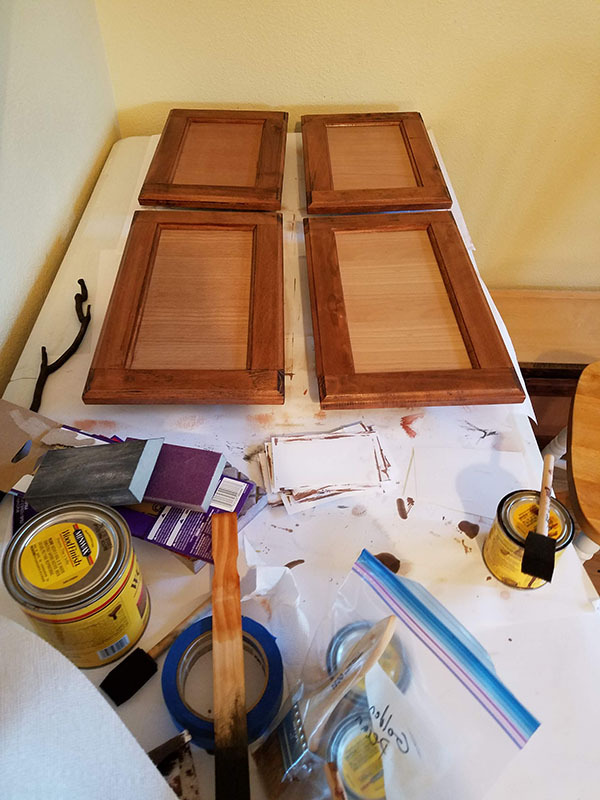 For the remaining cabinets the base will also be the lighter color so that the doors look like picture frames. We have some ideas about decorative things to do with those frames. Up next, pulling doors off of 11 more cabinets so that they can be sanded and stained. I’ve also got a window sill to assemble and stain. Now if only the weather would cooperate and warm up. Wood doesn’t stain well if it is below 60% so right now we’re having to bring things indoors to stain. It’ll be a lot faster when the garage is a good staining temperature and we can assembly line the work. So that’s where we are with the project this week. My hope is that we can have that pantry wall gone by the end of the summer. At times I have lamented missed milestones that I see my kids peers hit when my kids didn’t. It is hard not to feel the difference at those moments, particularly when social media gives me photographs. I remind myself that comparison is the thief of joy and work to find my own joy. I also must pause to recognize and rejoice in smaller milestones, often so small they aren’t really recognizable as such. Like this morning when my three living-at-home kids were all up for breakfast then they all traipsed out the front door laughing and chattering so my oldest could drop the other two at high school and head for a cafe to work. My house is empty of children because they’ve all launched into their days happily. My house is almost never empty of children, not since they started melting down six years ago. I’ve always had one or another here at the house, sometimes content, often depressed or suffering. It hurt my heart to see them making themselves small and hiding in my safe place because they were scared or wounded. But today they went out the door happily. They’ll return home in only a few hours, but the tiny launches and small flights are practice for much larger launches to come. I have to catch and remember these tiny milestones because between now and the larger launches will be more hiding days, more moments when I struggle to not compare. So today I catch a mental image of them going out the door chattering. Today they are happy and that is enough. Follow @OneCobble on twitter for links to blog entries as they post. 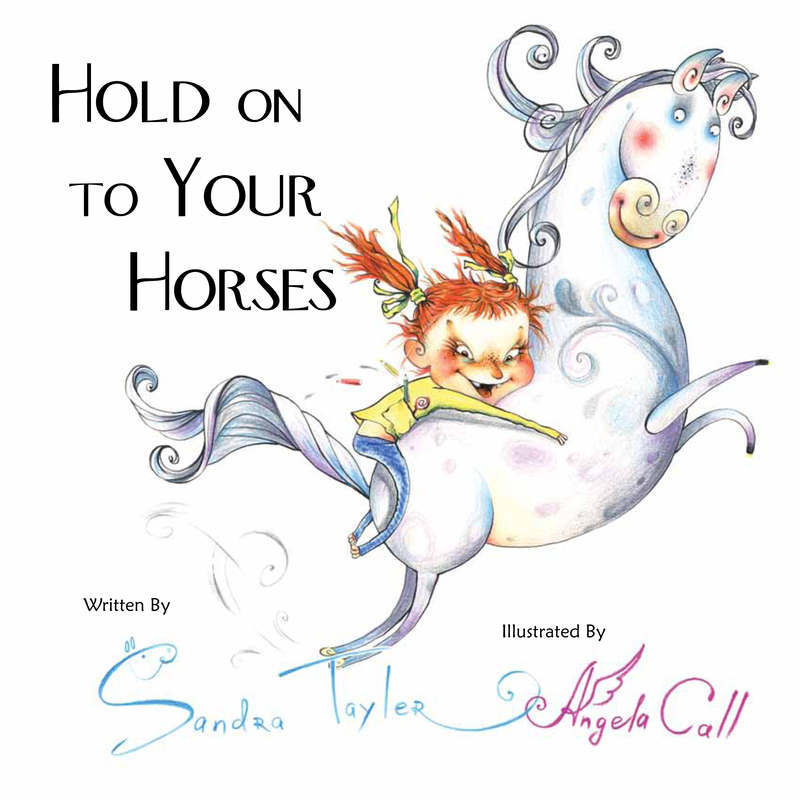 Follow @SandraTayler for random tweetery and conversations.